Right From Your Own Kitchen! 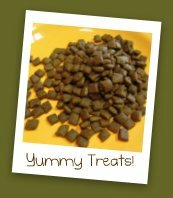 Home made dog training treats are easy to make and are a wonderful way to get the whole family involved! I use a LOT of treats during dog obedience training and dog trick training. 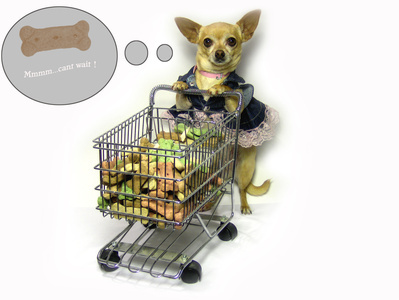 The purpose of a treat is to reward your dog for his good behavior and for attempting to do what you have asked. Dogs want to please their owners, but hey, learning is hard! Use dog training treats to keep him extra motivated when learning new commands or dog tricks. I've learned that tying to use a dogs regular daily kibble just doesn't cut it when training your dog. So using a small and tasty treat in the beginning to reward the desired behavior is just what your pooch wants, so go ahead. . . . . . give 'em the good stuff! Don't be stingy with the rewards either! Those tasty morsels are what motivates your dog, and the more you give him for every attempt, no matter how little it is, will make the training sessions more productive. And if you are using clicker training, make sure that after you have used the clicker for a correct behavior, follow it up with a tasty treat too! "Do I have to carry around dog training treats for the rest of my life? Heavens NO! Feel better now? In dog training, you have to make the behavior an automatic response for your dog. So, for example, after you have asked him to sit 100 times, and he sits, now the sit command has become an automatic response. Get it? The reason this happened is because as you asked him to sit and each time he did, you rewarded him with a dog treat. Bingo! You've just created an Automatic Response in your dog! Dog trainers refer to this as "Muscle memory", meaning when you ask your dog to sit and he does, this is what's considered an automatic response. Your dog hears sit and he does it automatically. Once you have gotten to this point you can start weaning your dog off his expectations of getting a dog training treat every time he does what you ask. The purpose of a treat is to reward your dog for at least trying. Each and every time he tries to do what you ask, give him a treat as a motivator. He will quickly realize that "hey, every time I do something, I get to eat. . .nice"
As your moving along with your dog training, what may have earned him a dog training treat in the past for just barely lifting his paw up may no longer be enough to earn that treat today. Why? Because, you know and so does he that he has already conquered this level of his training so now it's time to "Up The Ante." Watch as you read further, how, when your dog masters the dog command or dog trick what he gets. I call this the The Doggy Lottery"
For example, let's say when your dog is first learning how to shake a paw, in the beginning you'll need to reward him with a dog training treat for just barely lifting his paw off the ground, or even if he bats your hand. As your going along and he gets the idea of what you want, withhold the treat until he lifts his paw higher and higher or holds it up in the air longer. 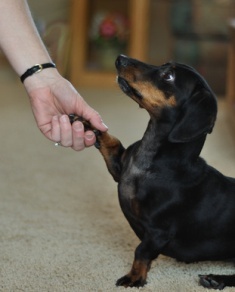 Basically, every time your dog is achieving a step that has about a 75% success rate, raise the stakes and require him to take it a step higher in order to earn that treat. Only give a treat when he has attempted the right command and of course when the trick it done right. Some dogs learn dog tricks quickly where as some dogs. . . well let's just say you may need to have a lot of patience AND a sense of humor doesn't hurt either. Don't expect to master a basic dog command or dog trick in one day. It may take days. Oh stop grumbling, sometimes it takes a while, especially when your working on harder dog tricks or dog agility courses. It may seem like your dog just isn't getting it, he may be pawing and obsessing over the dog treat that's in your hand and seem completely off track. That's ok, just keeping working. Putting the time in, no matter how long, is part of the process. Just continue to go over the same dog command or dog trick day after day, and then one day you will see that "light bulb" go off in his head saying "Hey! I Get It Now!" "He Hit The Doggy Lottery!" The idea behind this is, when applied to dog training, can be huge and a better motivator than giving out rewards constantly. Here's how you do it: Have your dog perform some basic dog command or dog trick that you have been working on. If he does them fairly good, don't give him a treat or even the smallest praise. BUT, when he does perform the command or trick VERY good, maybe even BETTER than he has in the past, BINGO! Give him a whole handful of dog training treats! That will make a happy impression on him don't you think! Watch him next time, as he tries extra hard in hopes that he will hit that handful lottery of dog training treats! Now that's what I call a motivator! 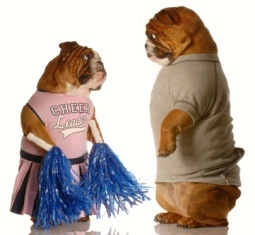 I also use several different types of dog training treats during dog training sessions. Sometimes I will cut up hot dogs very thin and use those as my motivator. Dogs can't resist the wonder of whats in the dog treat bag or your hand, especially when it might be some other scrumptious morsel! Just like people, your dog needs to be motivated during dog training. This is an extremely important step! He must always be achieving regular successes or he will become discouraged and quit. Try very hard not to let your dog be wrong more than 2 or 3 times in a row, he must feel as though he is accomplishing something. Think of it this way, if you kept trying to achieve something and you never got rewarded for anything, even the slightest success, you would become pretty discouraged and might want to quit, your dog is no different. Always make it a point to reward him with dog training treats for every little step he achieves until he gets it, no matter what. 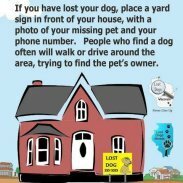 If the dog command or dog trick appears to be too difficult, go back to a simpler step that he has achieved, give the reward, and then move forward. Here's one of my favorite training treat recipes - Peanut Butter Dog Training Treats. Super Easy to make and they gobble 'em up!